Behind the name of Galactic Underground is hidden Belgian soundscaper Johan Geens, who is rather known for his Venja project focusing on more chillout, downtempo oriented electronics. As the name of the project suggests, on "<G.U>" Johan dives into ambient deep space realms. 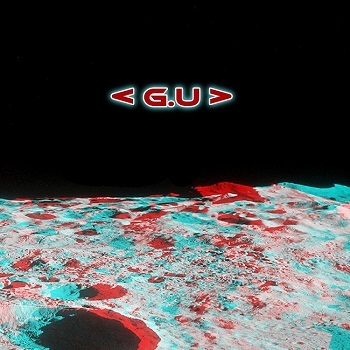 The album is out since October 16th 2017 on Wool-E label, based in Gent, Belgium, and I was immediately impressed by the high-quality packaging as "<G.U>" comes as a 6-panel DVD size digipak with panoramic poster & 3D glasses with fully transporting photographs of cratered lunar plains. A truly top-notch caliber, rather rare these days when the labels try to push down their pressing expenses. Kudos to all involved for such visually impressive product!!! 7 and a half minutes long "Destination Unknown" unfolds the odyssey with arising ear-tickling space glitters, which immediately ignite and ascend awe-inspiring solitary expansions, nebulously immense, gracefully nuanced and massively engrossing. Yeah, it's quite obvious the visual part of the album is instantly bridged with the creative signatures of its sole protagonist, pure beauty!!! "Sky Ripped", with nearly 11 minutes the second longest journey on "<G.U>", keeps safely on the path with drifting and ebbing stratums meticulously juxtaposed with continuously emanating dissonant glimpses. As much titillating as intriguing. Additional layer of subtly cadenced sequences quietly permeates across and amalgamates with intangibly infinite spirals. On "Emerging" quietly evolving, yet swiftly climaxing helixes commingle with NASA astronaut radio transmissions. "Mirage" coalesces organic quietudes and rattles, ascending reverberant meridians, trembling enigmas, remote winds and glancing ghostly groans, before clandestinely transmuting into tribal-infused domains, where the maestro Robert Rich gets guest credit for his percussive insignias. Another big one! "Oblivion" delves into ambiguously unfathomable depths with sparse deep beat, punctured by gossamery contemplative tinkles. Rawer layers inconspicuously climb from the void along with monochromatic drone splendor. Wow, a truly jaw-dropping ride!!! Extraterrestrially panoptic soundsculpting on 5-plus minutes long "Burning" brings to the foreground stunning vocal performance by Ukrainian vocalist, based in Poland, Roksana Vikaluk. With her richly expressive chants and vocals in Ukrainian she immediately shifts the listener into another spectacularly flavored and poignantly enrapturing domains. Bravo! On "Solitary Waves" excels another renowned guest musician, this time it's a famous ambient guitarist Erik Wøllo from Norway. His exquisitely lyrical strings masterfully integrate with Johan Geens' warmly celestial billows. Well done, Gentlemen, well done! The next composition "Blooming" brings back to the stage Roksana Vikaluk, who again steals the spectacle with her stunningly embracing vocal performance riding on the wings of Johan's perplexingly undulating washes. More please! "Photons Colliding", the longest piece on the album clocking just over 12 and a half minute mark, keeps on the orbit with subtly disruptive tides, but after about 3 minutes more lively synthetic throbs infiltrate and maintain the rhythmic efficiency over the course of the track. An array of glimmering sequences overrun as well for the most spirited quest so far. Short "Leaving", as displayed by its title, astrogates the journey into conclusion with evanescent heartbeats, glitchy fragments and balmily engulfing horizons mildly imbued by auxiliary voice transmissions. Brief, yet very efficient.